If you’re a consummate traveler and are constantly hopping from one major city to the next, you’ll be interested in learning about the warp-speed travel break-through from Elon Musk, CEO of SpaceX and Tesla Motors. 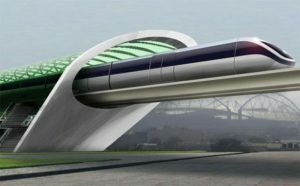 As CNN reported on Aug. 12, Musk’s proposed Hyperloop transportation system would utilize enormous tubes and an air-bearing suspension system to propel passengers at approximately 700 mph, making a trip from LA to San Francisco a 35-minute journey. If the plan comes to fruition, Hyperloop would be faster than commercial flight and twice as quick as the world’s fastest train.